Here's a terrific outdoor (or indoor) decoration for your home during the fall months, she's as cute as could be! 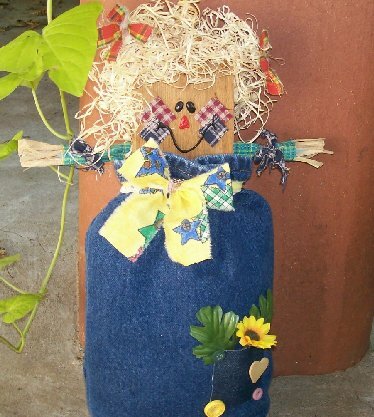 This adorable blue jean scarecrow greeter is the perfect touch to welcoming your guests this fall. Place her at your doorstep or on your Thanksgiving table with an abundance of colorful fall leaves at her base. 1. Cut off one blue jean leg, 14" from the bottom. Sew the cut edge together using a 1/2" seam allowance. To allow the scarecrow body to stand up, sew a flat, boxed bottom, measuring 2 1/2" wide. 2. Fill the Ziplock bag with one cup of sand or kitty litter and place in the bottom of the jean leg body. Fill the rest of the body with Polyfil. 3. Apply glue hot glue to the bottom of the cedar fence picket. Push the cedar fence picket into the polyfil, about two inches down. 4. Tear a 1 1/2" x 24" strip of fall fabric. Tie the strip of fabric around the body's opening and cinch to secure it against the picket. Tie the ends in a bow. Apply glue under the jean neckline and press to the picket. 5. Cut several raffia strips 11" long for the arms. Bundle the raffia. Create sleeves by wrapping fabric around the length, allow for an inch of the raffia bundle to stick out on each end. Overlap the fabric length and glue to hold. Tie ripped strips of fall fabric around the wrists. Apply hot glue to the back of the picket just above the blue jean body and attach the arms. 6. Create hair on the top, sides and back of the cedar fence picket by hot gluing bunches of excelsior. Rip strips of fall fabric and tie two bows. Glue the bows to the hair. 7. Cut four small 1" squares from the fall fabric. Overlap and glue two squares on each side of the face creating the cheeks. Place the scarecrow on a flat surface, on it's back. Paint the eyes, nose and smile using the dimensional paint. Allow the paint to dry overnight. 8. Cut a pocket from the blue jeans 2" x 2 1/2". Hot glue two 2 1/2 " sides and one 2" bottom of the pocket and apply it to the front of the scarecrow. Place the miniature sunflower and leaves in the pocket and glue. Finish by gluing the assorted buttons to the pocket corners and the heart on the front. Copyright © 2008 by Cyndee Kromminga. All rights reserved.